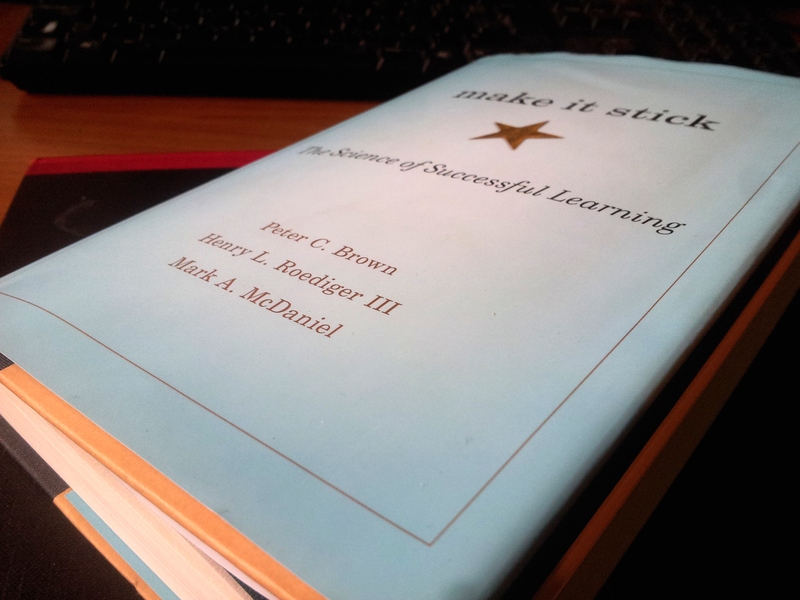 So, I’m back from Cardiff, and while it was a hugely interesting three weeks or so down there, the single most exciting moment might have come just a day or two before I caught the train down, when my copy of ‘make it stick’ arrived. Ever since I got to know some of the linguistics researchers down in Cardiff, I’ve been struggling to explain how the SaySomethingin approach works. They enjoy the fact that we run counter to some of the key theories in the field – and I do too – but it can make for a fairly frustrating experience sometimes, when people in the middle of serious research say ‘Oh, right, so you’re using [xyz] approach – you shouldn’t, that doesn’t work’! No, not very convincing, I know. But now, ladies and gentlemen, a new dawn has, er, dawned. Indeed! Thanks to Peter Brown, Henry Roediger III and Mark McDaniel (two of whom are cognitive scientists at Washington University in St. Louis, and the third a storyteller), I now know that a number of the key elements in SaySomethingin are a very close match for some of the most interesting recent research findings about how memory and learning work. I could just leave it there, and tell you to go and get your copy if you want to find out why SaySomethingin works, as well as how you can use similar concepts to strengthen your learning in every part of your life. I think we can reasonably call SaySomethingin effortful, can’t we?! This, I suggest, is why hearing a prompt in a known language and saying it in the target language is so much more valuable than looking at lists of words or even trying to remember what a word in the target language means in your own language – the production is so much more challenging, so much more difficult, it encodes stronger memories. This, I think, is a large part of why people are drawn to repeating sessions unnecessarily – because the process of letting the spaced repetition build into successful memory feels difficult, they seek confirmation of the learning process by repeating entire sessions. It’s also a large part of why people often don’t feel that interleaving (more on that later) is effective (even when it improves their results) – but we have a slightly different pattern there, because people who do the first few sessions of a SaySomethingin course usually feel that it has given them significant short-term gains. Perhaps we manage to have enough obvious early success in the learning process to counter the challenging nature of the work? This is the heart of SaySomethingin, of course – once you’ve had exposure to a new item, you then need to retrieve it over and over again. Every single prompt is a mini-test. You can see why I enjoyed reading this, can’t you?! Our version of interleaving two or more ‘subjects’ is the way in which you continually have to produce words and structures in different combinations and different contexts. The spaced repetition is, of course, central to everything we do (and every single word or structure gets included in the spaced repetition) – while the bit about getting ‘a little rusty between sessions’ is, I suspect, why we see such remarkable results when someone does a couple of days of high intensity and then takes a few months off. You’ve probably rolled your eyes in the past at how much I harp on about the importance of making mistakes – but here is scientific evidence that errors in production (when they’re followed by confirmation of the target answer) are a genuinely valuable part of the learning process in and of themselves. I was pretty much singing ‘Hallelujah!’ by this point, and you’re lucky you didn’t have to listen to that. Yes, that’s the sound of me joining a gospel choir in the background. Because interleaving is even more central to SaySomethingin than spaced repetition itself, this is, I suspect, why we see our learners doing so much better in conversational settings. Instead of learning rules of grammar, they’ve had to deduce them from exposure to different sentences, and that makes them better at finding ways to produce new combinations successfully. Amen, brother! Now that’s the truth. This isn’t really new, is it? I was told in secondary school that revision aids such as key facts cards were useless and the trick was to sit down with a set of blank cards *and to write your own*. Sounds as though you had a good teacher on that particular point – but re-reading texts remains a hugely popular approach to ‘study’, and there is strong and recent evidence that shows it’s largely ineffective. Every single student in the undergraduate lecture I gave the other week saw re-reading texts as a central part of their revision. If ‘new’ is ‘no-one has ever done any of this stuff before’, then no, it’s clearly not. But if ‘new’ is ‘includes studies from this millennium which show that standard approaches are largely misplaced’, then yes, it very much is. And I’d certainly not found any previous material that showed clear evidence for the productive element of SSi. SSi makes both vocabulary and structure active almost from the word go. i.e. The learner starts to produce the target language within probably the first 30 seconds of the 1st lesson, and that continues all the way to the last lesson. Yes! We know it works. Nice to have the promise of some supporting theories. I know from experience that engaging in conversation, hearing and using a word, then using it again later on, cements it in my mind. The SaySomethingin method simulates the kind of practical application and retrieval.